To Disney-ABC, it seems ending is better than mending. Freeform has cancelled its Stitchers TV show after three seasons. Since there will be no fourth season, Stitchers, episode 3.10, “Maternis,” will serve as both the season three finale and the TV series finale. 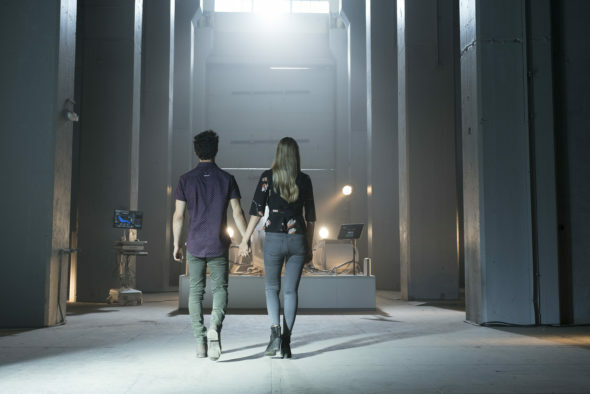 Airing on the Freeform cable channel, Stitchers stars Emma Ishta as Kirsten Clark; Kyle Harris as Cameron Goodkin; Ritesh Rajan as Linus Ahluwalia; Salli Richardson-Whitfield as Maggie Baptiste; Allison Scagliotti as Camille Engelson; and Damon Dayoub as Detective Quincy Fisher. A sci-fi crime drama, Stitchers centers on Kirsten Clark (Ishta), a Caltech grad student who is recruited into a covert government agency to be “stitched” into the minds of the recently deceased. Using memories of the dead, Kirsten is able to help investigate murders and decipher mysteries that otherwise would have gone to the grave. The third season of Stitchers averaged a 0.13 rating in the 18-49 demographic and 365,000 viewers. Compared to the already low-rated season two, it was down by 14% and down by 6%, respectively. Among the 10 Freeform TV shows we’re tracking, the third season of Stitchers ranked seventh in terms of total audience size, and dead last, where its demo ratings are concerned. Deadline has confirmed that Stitchers has been cancelled after three seasons on Freeform. What do you think? Were you a Stitchers fan? Should it have been cancelled or renewed for season four? Sound off in the comments. Stitchers is a unique show, it was a drama with twists unlike the other repetitiveness we see continuously. There a several, police, medical, csi, and reality shows. When a network digs deep and comes up with an amazing show like this, where me and my family eagerly wait for the next week, I say to you please run a season 4. She was great….please renew….if not, have a 2-hr. TV movie finale, so we can all have a happy ending to the stories of all the characters. 🙁 great show… great actors… so sad to finish the show and look up when season 4 would be out to find out its cancelled…. :'( super dissapointed! Stitchers was a refreshing change from continuous police, FBI, CIA tv series. It was unique I’ve never seen a show like it, which is why the series was awesome. I loved the characters intelligence, innocence, and real life story lines. Always always the unique tv shows get cancelled, meanwhile forced to have yet another NCIS, CSI, OR Medical series. We all know the gist of those shows there repetitive. Bring back STITCHERS PLEASE PLEASE. I loved Stitchers. I just read that it was cancelled. I am very disappointed. Please bring it back even if I have to watch it online. Was so uncool how you guys just ended the show. Such a dramatic ending left us with so many questions, and u just decided to end it. So not cool, I absolutely loved this show have rewatched it at least 3 times, never gets old. Really hope you guys reconsidering making a 4th season, I would definitly watch it. I get the reasons are not high enough for your liking, but when you introduce s show arms got 300 some odd thousand people hooked and then leave us with an ending like that, it’s pretty screwed up! I’m a big stichers fan and y’all should have gave us a better ending! Tired of getting into a show then y’all cancel and leave it unsolved that’s not fair to us they do watch it! Please don’t cancel!! There is still so many unanswered questions. Season 4 should be made, so that all those questions can be answered. If this really is the ending, then it is the worst ending I’ve ever seen!